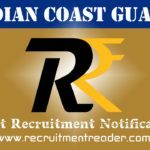 Latest Southern Railway RRC Recruitment Notification 2019 – Southern Railway Recruitment Cell (RRCMAS) published notification of General Departmental Competitive Examination (GDCE) for recruitment of Goods Guard. RRC Chennai is going to fill 96 vacancies through Goods Guard GDCE. Candidates who have eligibility as per RRCMAS Notification may apply for the exam through proper channel in prescribed format. The Application format can be downloaded from RRCMAS website. The Last date to submit the application form is 01.04.2019. Before apply for the GDCE, candidates should ensure that they fulfil the eligibility criteria given in the advertisement. Also be aware of exam date, exam pattern, compensation, selection process and application process from the advertisement. Southern Railway will not consider incomplete applications and applications received after the last date. So submit the application form on or before the last date. Upper age limit is 42 years as on 01.07.2019. Age relaxation is applicable for SC/ST/OBC candidates. Degree (10+2+3 stream) from a recognized institute. Look into RRCMAS advertisement for more details of qualification. Download the application format from RRCMAS website. Send the completely filled application form to The Chairman, Railway Recruitment Cell, No.5, Dr. P.V. Cherian Cresent Road, Behind Ethiraj College, Egmore, Chennai – 600008 by post/ in person on or before 01.04.2019. Logon to RRC MAS website and then find notification for GDCE Goods Guard. Then find Notification and Application download link. Read the notification completely and then download the application form. 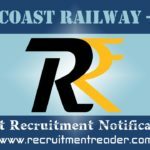 Find upcoming Southern Railway Recruitment Notifications @ Recruitment Reader. For more details regarding Southern Railway RRC Recruitment Notification 2019 logon to www.rrcmas.in. The information given above is based on the Southern Railway Recruitment Cell official advertisement. Southern Railway Recruitment Cell (RRCMAS) published notifications for the engagement of Act Apprentices in divisions under Central Workshop (Golden Rock), Carriage Works (Perambur) and Signal & Telecommunication Workshop (Podanur). RRC Chennai announced 4429 vacancies in the following divisions shown in the table below. Candidates who are eligible to undergo Apprenticeship training in southern railway may apply online at RRC MAS website. The Last date for the submission of online application form is 13.01.2019. Latest Update:- RRCMAS released shortlisted candidates list for Document Verification. Find the link to download merit list for DV at the table shown below. Upper age limit is 22/24 years. 10th/ 12th standard/ ITI in relevant trade. Candidates should remit an amount of ₹100/- towards processing fee. 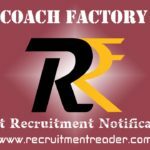 Logon to Southern Railway Recruitment Cell – RRCMAS website. Find the notification for the engagement of Act Apprentices 2018-19. Click the notification to find online registration link and advertisements links. Read the advertisements completely and then apply online. For more details regarding Southern Railway RRC Recruitment Notification 2019 logon to www.rrcmas.in. The information given above is based on the Southern Railway official advertisement. Southern Railway Recruitment Cell (RRCMAS) published notification for the recruitment against sports quota through open advertisement for the year 2018-19. SR announced 21 vacancies for level 2, level 3, level 4 & level 5 positions. Eligible candidates may apply for the recruitment through proper channel in prescribed format. The Application form is available in RRCMAS website. The Last date for the submission of the application is 14.01.2019. The Last date for the applicants belonging to Assam, Megalaya, Arunachal Pradesh, Mizoram, Nagaland, Tripura, Sikkim, Jammu Kashmir, Lahaul & Spiti districts and Pangi sub-division of Champa, District of Himachal Pradesh, Andaman & Nichobar and Lakshdeep Islands and abroad is 29.01.2019. Incomplete applications and applications received after the stipulated date will be rejected. RRC Chennai announced sports quota vacancies in the following sports/ games/ events, Athletics (Men), Athletics (Women), Boxing (Men), Body Building (Men), Chess (Men), Cycling (Men), Swimming (Men), Table Tennis (Men) and Weightlifting (Men). Level 4 & 5 positions – Graduate. Look into RRC Chennai advertisement for sports qualification. Applicants should pay an amount of ₹500/- towards application fee. Fee should be in the form of Demand Draft (DD)/ Indian Postal Order (IPO) in favour of “Financial Advisor & Chief Accounts Officer, Southern Railway, Chennai” payable at Chennai. For Women/ SC/ ST/ EX-SM/ PWD/ Minority/ Economically Backward Classes, fee is ₹250/- (Refundable to candidates appear in the test). Eligible candidates download the application format from the RRCMAS website. Send/ submit the completely filled application with required documents to/at “The Deputy Chief Personnel Officer/ R&W, Personnel Department, Southern Railway Headquarters Office, Park Town, Chennai – 600 003”. Application envelope should have superscription as APPLICATION FOR RECRUITMENT AGAINST SPORTS QUOTA (OPEN ADVERTISEMENT) FOR THE YEAR 2018-19. Logon to RRCMAS website and then look for Sports Quota notification. Send/submit the application as per the procedure given in the advertisement. For more details regarding Southern Railway RRC Recruitment Notification 2019 logon to www.rrcmas.in. The information given above is based on the RRC Chennai official advertisement. Southern Railway (SR) invites applications for the re-engagement of retired staff in exigencies of services in Tiruchchirappalli (TPJ) division. SR announced 13 vacancies for the positions of Loco Pilot, Assistant Loco Pilot and Goods Guard. Among 13 vacancies, 12 vacancies are announced for Mechanical Department (Loco Pilot & Assistant Loco Pilot) and 01 vacancy for Operating Department (Goods Guard). Candidates who have eligibility as per Southern Railway Notification may forward their applications through proper channel in prescribed format. Download the application format from the Southern Railway website. The Last date to submit the application is 26.11.2018. Candidates those who satisfy the eligibility conditions given in the railway advertisement are only eligible to apply for the re-engagement. The duration of the engagement is up to 01.12.2019. 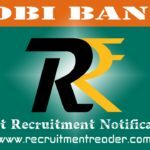 Send the completely filled application with required documents to Divisional Personnel Officer (Concerned Cadre Section) / Southern Railway / TPJ Division on or before the last date. Logon to Southern Railway website and then follow the below page flow. News & Updates>> News & Announcements>> Trichchirappalli Division. Find notification for Re-engagement of Retired Railway Staff in exigencies of service. 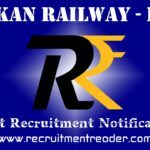 For more details regarding Southern Railway RRC Recruitment Notification 2018 logon to www.sr.indianrailways.gov.in. The information given above is based on the Southern Railway official advertisement. Southern Railway Recruitment Cell (RRCMAS) released a list of shortlisted candidates for Document Verification for the positions of Safaiwala and Paramedical categories. Recently RRCMAS conducted PET for safaiwala post on October 29, 2018 and online exam for paramedical Categories on 06.10.2018. Now they released successful candidates list for Document Verification. Candidates who have appeared in Physical Efficiency Test (PET) (Safaiwala) and online examination (Paramedical) can download the results from RRCMAS website. RRCMAS also released the schedule of Document Verification (Dates) for Safaiwala post. RRCMAS conducted the exam for Safaiwala & Para-Medical Categories posts on 06.10.2018 (Para-medical Categories) and 07.10.2018 (Safaiwala). RRCMAS also released results for the examination and requested candidates to download their results from RRCMAS website. Southern Railway Recruitment Cell (RRCMAS) invites application for the positions of Paramedical categories and Safaiwala on contract basis. RRC Chennai announced 328 vacancies for these paramedical categories and safaiwala posts. Candidates who have eligibility may register online for these vacancies at RRCMAS website. The Last date to submit the online application form is 27.08.2018. Age limit for Safaiwala – 18 to 33 years. Age limit varies for paramedical categories. 10th Standard/ 12th Standard/ Graduation in relevant disciplines. Look into RRC Chennai Notification for more details of qualification. For UR/OBC candidates, application fee is ₹ 500/- (₹ 400 refundable to candidates appear for screening test). For SC/ST/PWD/Women/Economically Backward/Minority candidates, ₹ 250/- (₹ 250 refundable to candidates appear for screening test). Logon to RRCMAS website and find notification for Paramedical Categories & Safaiwala. Click the notification separately to find advertisement and online application links. Read the advertisement completely and then register online for the recruitment. For more details regarding Southern Railway RRC Recruitment Notification 2018 logon to www.rrcmas.in. The information given above is based on the Southern Railway official advertisement.